This small, self-contained exhibit transforms a previously nondescript space into a paradise of botanical science. 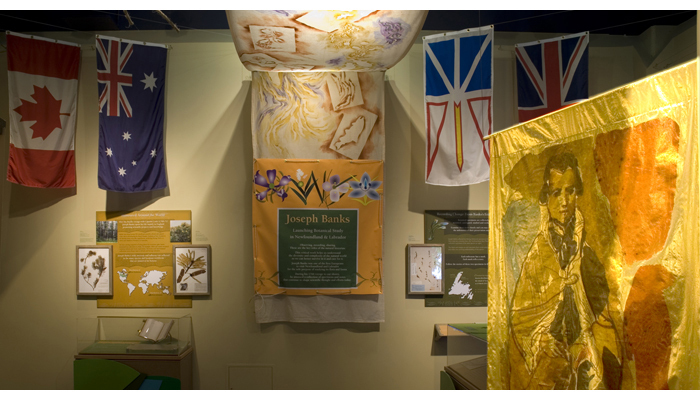 Starting in 2006 as a six-panel exhibit commemorating the achievements of early naturalists, it expanded in 2011 to include the story of Joseph Banks, one of the first Europeans to visit Newfoundland for the sole purpose of studying its flora and fauna. The walls are decorated with hand-sewn banners of our own design, with an additional layer of interpretive banners and panels featuring Sir Banks and highlighting his work. The presentation is engaging and inspiring, emphasizing the cultural environment of the time.